Lluis Domènech i Montaner was born in Barcelona on 21 December 1849 as the son of the book-binder Pere Domènech i Saló and Maria Vila i Montaner. Before Domènech was devoted to his study of architecture, he studied in Madrid two semesters of physics and natural sciences. He completed the architectural studies at the University of Barcelona in 1873. As a professor of the Escola d'Arquitectura de Barcelona, the famous architect school in Barcelona which he headed since 1899 for 20 years had used his influence in to create a central role for the playing out of promotion and dissemination of Catalan Art Nouveau, Modernisme. For his works he brought his inspiration from Moorish architecture. Playful looking mosaics and the light-flooded areas are the special recognition feature of his buildings, which is particularly at its main buildings recognized: the Hospital de Santa Creu i de Sant Pau and the Palau de la Música Catalana. Both buildings are located since 1997 on the list of World Cultural Heritage of UNESCO. 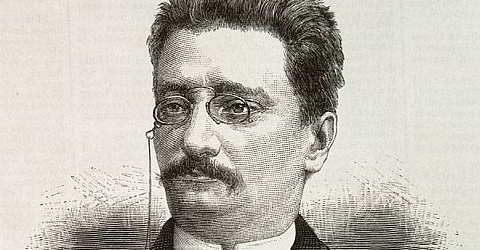 Domènech i Montaner as a politician also played a significant role in the autonomonious movement in Catalonia. He was a member of the Centre Nacional Català (1889) and Lliga Regionalista, whose president he was. Disillusioned by the possibilities of a politician he returned, however, back in 1904 and devoted himself only to architecture and archaeology. In addition to the career as an architect and politician, he was also a well respected author and journalist, known in many circles - newspapers as well as political journals. Only a few days after his 74th Birthday, he died on 27 December 1923. Modernisme was part of the "La Renaixença," the Catalan rebirth of art and architecture employed and its influence is still recognizable everywhere in Barcelona and Catalonia. The Renaixença was a Catalan nationalist currents in the second half of the 19th Century, the Catalan culture and autonomy to a rebirth (Renaixença) gained after it since the Spanish war of succession (1701-1714) steadily declined in importance. Despite efforts to broad autonomy, the fate of the Spanish total interconnection is not in question. Modernisme was not a style, with the old closed and only new produced. On the contrary, the Modernisme, the greatest value to old traditions and techniques. So let e.g. Gaudí at his craft school on the Sagrada family teah the traditional craft techniques. You can justify Modernisme as a bridge between the elements of Moorish architecture, the Gothic and Renaissance. Inspiration from the past and together with the traditional techniques united on the limits of styles in our Modernisme. Some 2000 buildings in Barcelona and Catalonia, the lines of Modernisme. The most important representative of Modernisme are Antoní Gaudí, Lluis Domènech i Montaner and Josep Puig i Cadafalch. 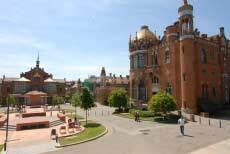 As a tourist you like to take a look at the Hospital de Santa Creu i de Sant Pau. The hospital was built to help the sick recover in a pleasant atmosphere. The Palau de la Musica Catalana, which is listed on the UNESCO list of world cultural heritage, is an impressive concert hall. 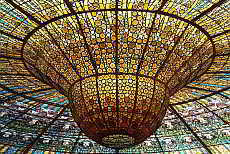 The construction is the splendour Catalan Art Nouveau (Modernism). 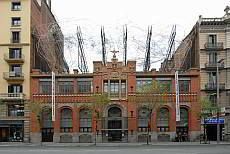 The Fundacio Antoni Tapies houses the works of the most important artist Barcelona's after Miró. The building was rebuilt by Domènech. The red brick building, which now dominates the Zoological Museum, is built by the well-known architect of Modernism Domènech i Montaner. 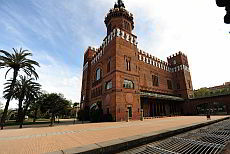 It was the first building of the Modernisme und was opened as a café for the Wold Excibition 1888.